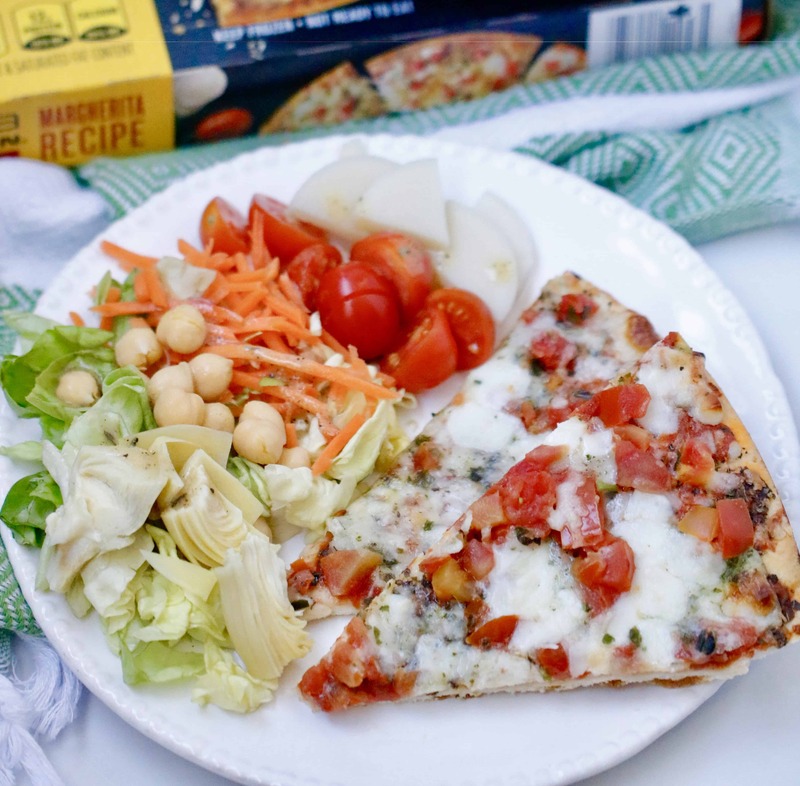 Disclosure: I’m so excited to be partnering with Nestlé’s Balance Your Plate program and California Pizza Kitchen Frozen for this post. As always, the Shaw Kitchen only partners with brands that align with my core values. Thanks for supporting the brands that keep Shaw’s Simple Swaps up and running! Remember those 10 tips we chatted about to keep your New Year’s Resolutions on track?! Well my friends, I’m here to show you today with the folks from California Pizza Kitchen (CPK) Frozen that you can continue to reach your 2018 goals without giving up your favorite foods! One of the key components of sticking to resolutions IMHO has always been to never label foods as off limits. The second we go into that dichotomous thinking that food is either “good or bad” we lose all hopes of changing our patterns and developing a healthy, sustainable lifestyle. That’s why I love Nestlé’s program, Balance Your Plate. It gives you the tools to create a balanced meal, save time and still enjoy your favorite staples. There are no foods that are off limits! You can enjoy a variety of foods, including pizza and other frozen entrees, by balancing them out with a side selection of fruits, vegetables, lean protein and/or whole grains. P.S., you may remember my post about it here back in September. Gosh who doesn’t love Mac and Cheese made with REAL Vermont white cheddar?! 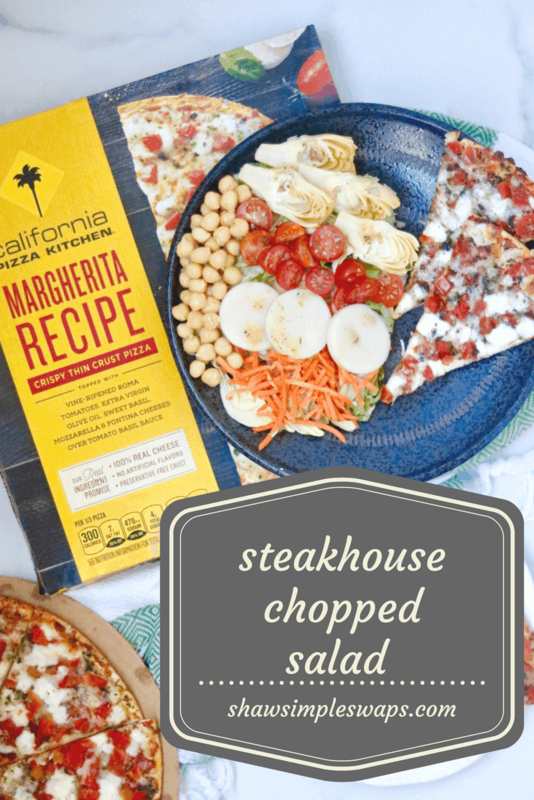 For instance, you can start with a delicious frozen pizza (like CPK Frozen) and pair it with a nutritious side, like this Steakhouse Chopped Salad I whipped up in the Shaw Kitchen. The beauty of incorporating frozen foods into your weekly routine is that they can lay a beautiful canvas for a healthy meal to come together in minutes. 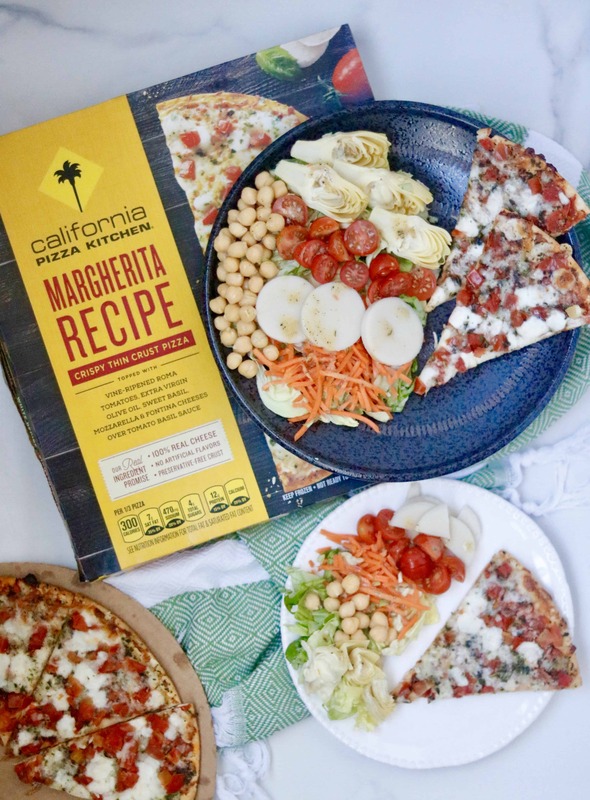 Whether you choose to place a variety of veggies on top of your CPK Frozen pizza or pair it with a fun side (like the variety of choices available here), the possibilities are endless for healthy, balanced eating. If you’re wondering how to break this down, let me give you a quick formula! While the equation may seem simple (gosh if only all things could be this easy, right?! 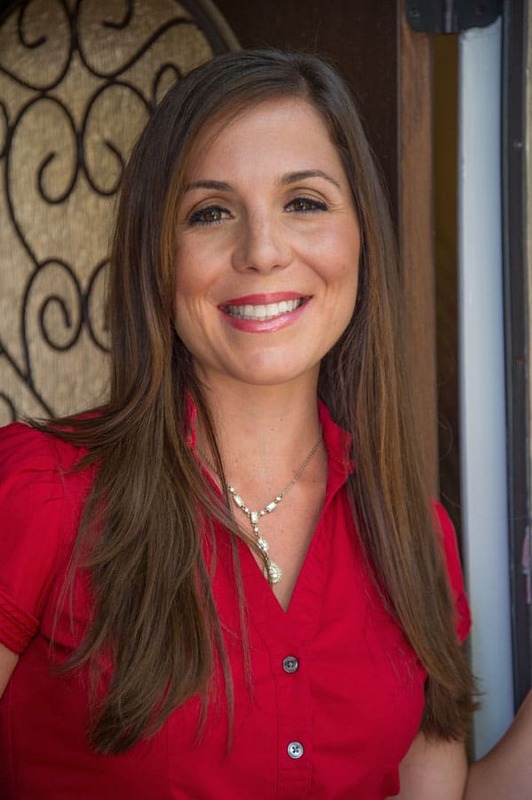 ), there are a few other key areas to pay attention to when balancing your plate. Pizza is a classic favorite that you can enjoy as part of a healthy diet when you’re mindful of portions. Use your hand as a general guide for portion size – enjoy one hand’s worth per slice. Since this is thin crust, most people find an adult serving is satiating at 2-3 slices. But, use your hunger and fullness as your own guide! As you can see, the slices pair perfectly with the Steakhouse Chopped Salad for a delicious, balanced dinner! Elevate the nutrition and flavor by adding more produce to your meal – we all could use more fruits and veggies in our lives! Whether you choose to add it on top (hello gorgeous zucchini pepperoni slices), or on the side, the possibilities are endless. And, another super cool thing about CPK Frozen? They’ve got gluten-free crust and options made with organic ingredients! You know from my European adventures and explorations in New Zealand I love to travel! That’s why I love how California Pizza Kitchen Frozen pizzas takes their inspiration from global cuisines! Their pizzas are made with hand-selected ingredients, including 100% real cheese, no artificial flavors and preservative-free crust. You can learn more about how their recipes are developed and their ingredients are sourced here: http://www.cpkfrozen.com/something-unexpected. Now that we’ve got the basics out of the way, shall we dive in?! Follow instructions on CPK Frozen Margherita Pizza box to heat pizza. While pizza is cooking, prepare salad. Begin by chopping all salad ingredients in said quantities if you haven’t purchased pre-chopped. In a medium bowl, add chopped butter leaf lettuce, garbanzo beans, cherry tomatoes, carrots, artichoke hearts and heart of palm together. Gently mix together with salad tongs. Set aside and prepare dressing in a small bowl. Using a whisk, mix Dijon mustard with honey, vinegar and lemon juice. Add in the spices and continue to whisk. Slowly pour in the olive oil and whisk vigorously to combine. Add a dash of sea salt at the end and mix one more time. When pizza is cooked, prepare salad by mixing the dressing into the vegetables. Serve pizza with side salad. Looking for more inspiration? Don’t forget, visit the Balance Your Plate Pinterest board at https://www.pinterest.com/balanceplate/ for more meal inspiration and ideas! I love California Pizza Kitchen! Haven’t had it in ages since it’s so far away. But think I need to go get some and try this salad. It’s the perfect balance! Totally stop by your freezer section! So worth it to have one on hand! You had me artichoke hearts! This salad looks fantastic! Thanks Sara! They’re delicious aren’t they! This looks like a great way to change up pizza night! I am going to have to get one soon! You won’t regret it I swear! That’s how we enjoy pizza – with salad! It definitely helps to keep the meal balanced and the two are so great together. The perfect pair I always say!! Great tips for balancing your plate! 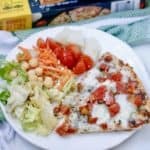 The pizza and salad is a great dinner for busy weeknights! Thanks Jess! A family favorite over here! Pizza and salad is a fun Friday night dinner! So easy and delicious!
? I totally agree! The team behind Nestle is doing some amazing things! I would gladly have you for lunch any day! That is one colorful salad – so many great ingredients in it! 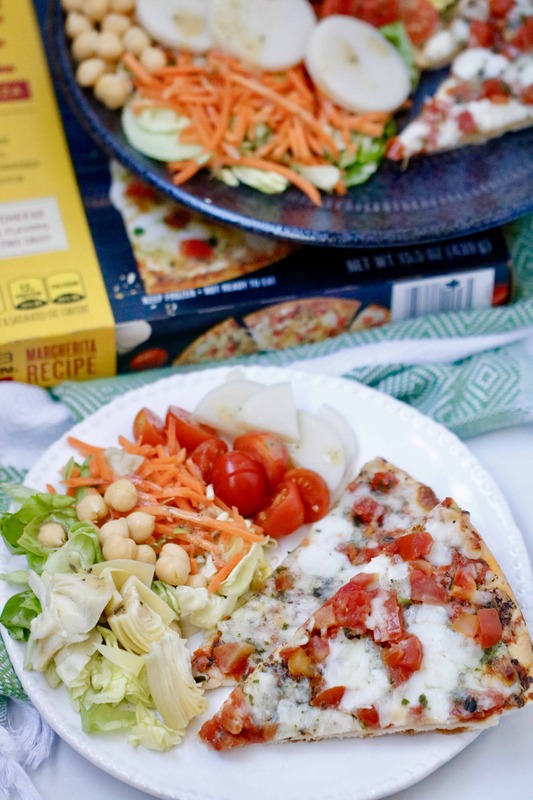 I love pairing a filling salad with pizza – always a great combo! So true! It’s so satisfying too! And that they have a GF option, too! My favorite! Your salad looks so yummy! We had pesto pizza & kale Caesar salad last night for a family Valentines dinner-it was perfect! I didn’t know CPK had a frozen gluten free pizza-will look for it next time I’m at the store. That salad sounds delicious! And yes!! Their GF one is totally my favorite actually! I hope you do! Seriously such a hidden staple ingredient now in our rotation! That sounds like a perfect lunch to me!